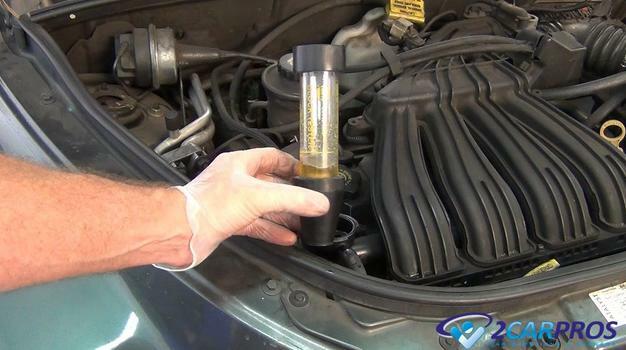 Engine coolant is used to help keep the engine from overheating during its normal operation. Engine coolant flows through the radiator, radiator hoses, heater core, heater hoses and water pump which circulates the coolant throughout the system. As the cooling system ages it can leak which will allow the coolant level to drop and will cause the engine to overheat. The coolant system consists of rubber hoses, gaskets and seals which are subject to engine heat and vibration which in time can cause these items to fail and start leaking antifreeze. With some minor troubleshooting you can find where the leak is coming from to see if you can fix it yourself or have a repair garage do it for you. Costs for a coolant leak repair can range depending on the problem which could be as simple as a radiator hose or about $45.00 (US) and as difficult as a head gasket or about $1400.00 (US). The best thing to do when you spot a leak is to try and find it and see what it will take to fix it. There will be two kinds of coolant leaks, both will cause the engine to run hot and boil over. The first kind of leak will be obvious and can be easily detected while the second kind of leak will be noticed as the coolant level low warning light will come on while the coolant level slowly drops down over time as you continually add coolant. Before checking for leaks wait until the engine is cool and then open the hood for inspection. Many times just by looking around the engine bay you can detect a leak using a flashlight and looking for green, orange or blue coolant. We will start with the easier problems and then continue to the more difficult to find repairs. Spring loaded or O ring hose clamps are use to connect various cooling system accessories such as a radiator or water pump. These connections can leak due to a failing O ring or a broken or misaligned hose clamp. In the image below we show a worm style clamp which is loose allowing coolant to leak from the system. 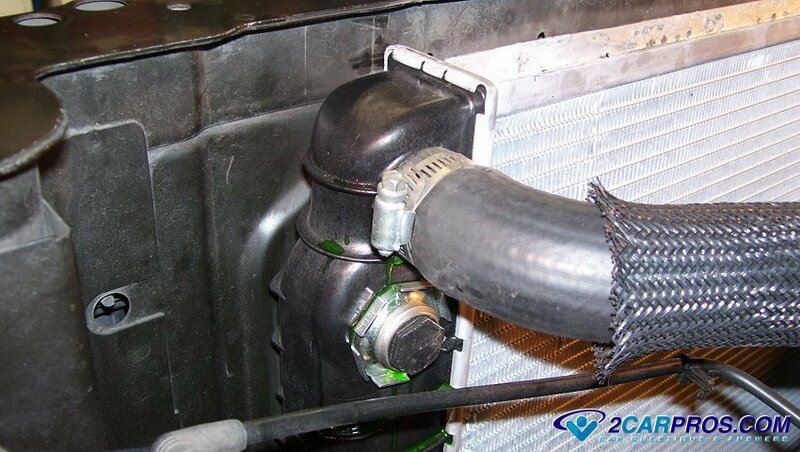 Sometimes a radiator hose will not seal well due is corrosion under the hose or the hose clamp being not positioned correctly. 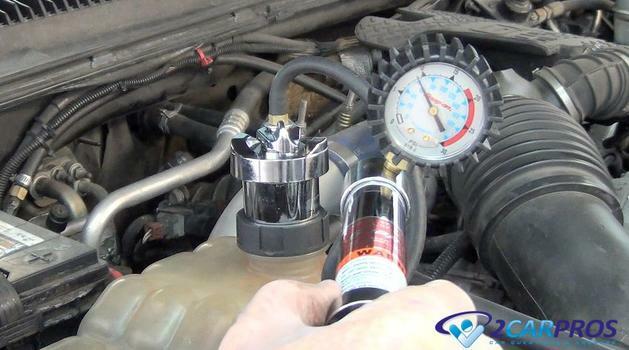 Release the cooling system pressure by slowly removing the radiator cap and reposition or replace the hose clamp. 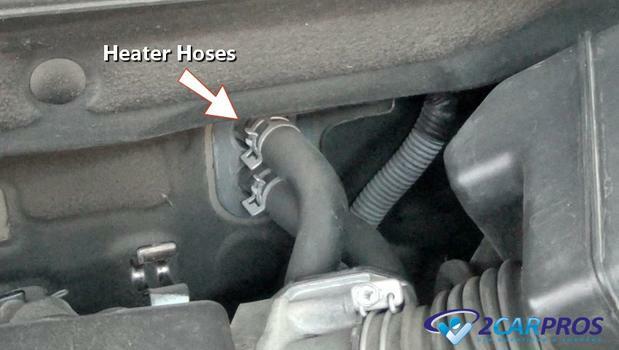 A radiator hose retains pressure when the engine is in operation. Because these hoses are made of rubber they can get fatigued and burst allowing coolant to leak from the system. These leaks are usually very obvious and sudden and will require the coolant hose to be replaced to prevent engine damage. Heater hoses are used to transfer hot coolant from the engine to the heater core where the heated coolant is used to provide comfort to the passengers of the car in cold weather. 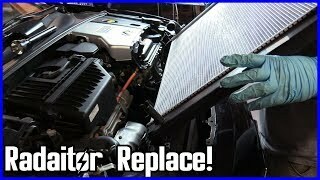 If the heater hoses fail coolant will leak inside the engine compartment on the passenger's side and create steam as the hot coolant is vaporized on the exhaust manifold indicating the heater hoses need to be replaced. The radiator is designed to allow coolant to flow through its internal cooling tubes which will help the engine run at a normal operating range. When a radiator ages it can cause one of its plastic tanks to crack which will allow antifreeze to leak out. 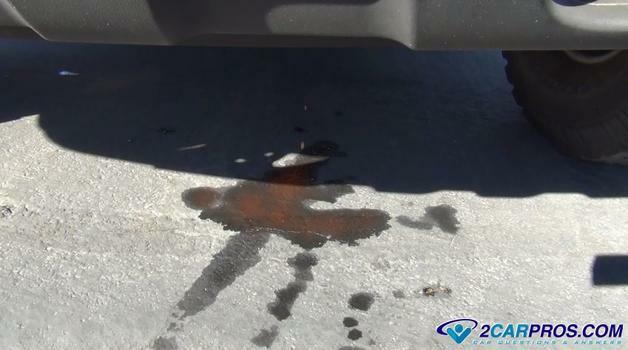 When this problem occurs it will sometimes leave signs of dried coolant which can be detected by an inspection. While replacing the radiator in the image below we also flushed the cooling system to help prevent the old coolant from becoming acidic which will cause additional leaks. 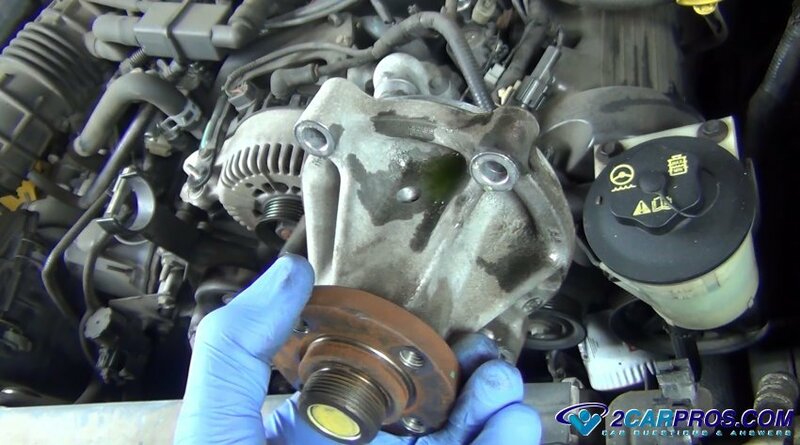 A water pump is mounted to the engine block or timing chain cover and is designed to circulate coolant throughout the radiator, engine block and cylinder heads. A main shaft seal is used to prevent coolant from leaking from the pump housing. When the water pump seal fails it allows a leak from the pump's weep hole which is seen in the image below. To stop the leak you must disassemble additional parts to replace the water pump such as a serpentine belt or cooling fan. A common coolant leak can be traced to the radiator coolant reservoir which will continuously cause the cooling system to lose coolant. 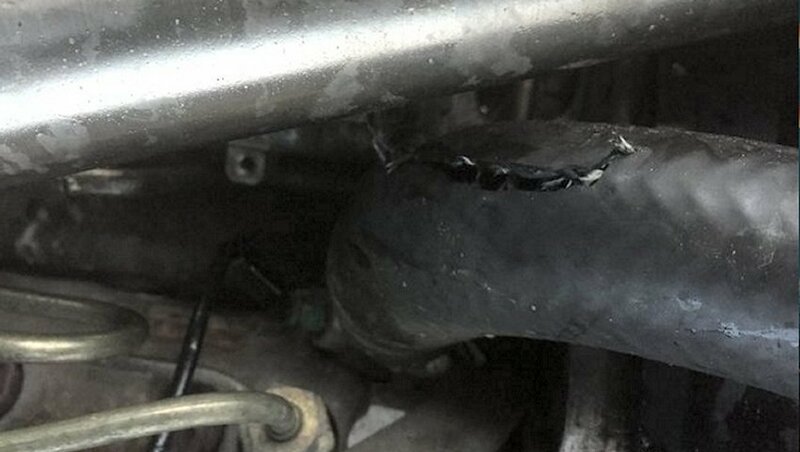 Because the coolant reservoir is made of plastic it can crack allowing the leak as the radiator pushes expanding coolant into it. Using a flashlight inspect the tank and if a leak is found replace the coolant reservoir tank with a new part to fix the problem. 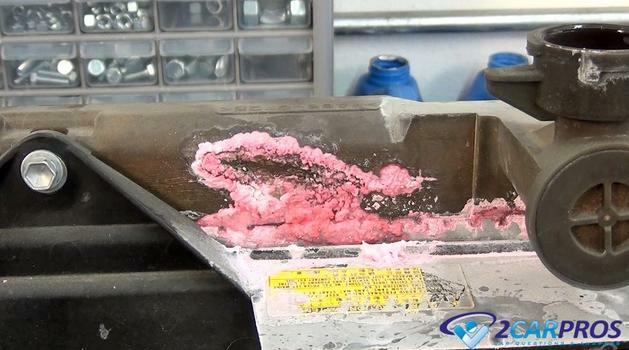 Sometimes when a coolant leak is not obvious you must create pressure inside the system to force the leak to appear. This is done using a cooling system pressure tester which you can get from Amazon for about $55.00 (US). If the cooling system is low and the leak is in the upper portion of the system it can be difficult to find because just air will leak out. Refill the system with water and use the tester to apply pressure multiple times until the leak can be found. The head gasket is designed to seal the cylinder head to the engine block. This gasket is made with steal rings embedded into its material to help project the gasket from the extreme pressures the engine produces in the combustion process. 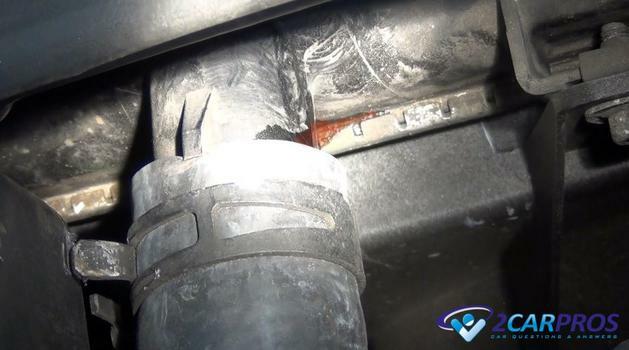 Over time heat and corrosion with cause the gasket to leak internally in most cases either pushing exhaust into the cooling system or allowing coolant to leak inside of the engine. There are several tests that can be used to determine if the head gasket has failed in which case the gasket should be replaced. An intake manifold gasket is used to seal the intake manifold to the engine's cylinder head. This gasket helps seal the engine's vacuum and coolant passages which feed either cylinder head on some V8 and V6 engines on one cylinder head on straight 6 and 4 cylinders. When this gasket goes bad it can allow coolant to leak either outside or inside the engine. It usually takes between three and four hours to replace the intake manifold gasket to avoid any engine damage. A set of freeze plugs are designed into a car’s engine block as a safety measure incase the engine ever freezes. Most engines will have 6 to 8 of these plugs in various places which will push out allowing the expanding frozen coolant to exit the block without cracking it. Freeze plugs are made of a relatively thin piece of metal which can rot out and allow coolant to leak from the system. Many times the cooling system will need to have pressure in it to observe this kind of leak. When replacing a freeze plug it recommended replacing all of them to avoid future additional leaks. The last part of the cooling system is the heater core. This core is constructed much like a small radiator and in fact looks like a mini version of the radiator located inside of the HVAC system located in the car on the passengers side. A coolant leak will appear on the passenger's side floorboard indicating the heater core has failed and needs replacement. If you have any questions about cooling system leaks, please visit our forum. If you need car repair advice, please ask our community of mechanics is happy to help you and it is always 100% free.